Congratulations to Keith Beaumont and Charlene Cunningham on their recent wedding. May they be blessed with a long and happy life together. 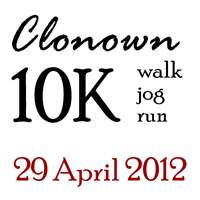 The Clonown Pastoral Group and Community Site Project are pleased to announce that the third annual Clonown 10k Walk and Run will take place on Sunday 29 April 2012. Walkers will depart at 1.30pm and runners at 3pm from Clonown Community Centre. Walkers can register on the day with a donation. Full details of this year’s extended event are available on www.clonown.com or contact Paul Curley (086-3349585) or Ann Dunning (087-2261096). Monthly meeting in Drum Community Centre on Tuesday 1st May at 8.30pm. All members please attend. Membership fees now due. Are you a micro-enterprise business based in Co. Roscommon? Did you know you could benefit from Rural Development grant supports? Short information evening will be held to explain how your business can access these supports. Roscommon LEADER Partnership have significant funding to allocate and welcome innovative proposals linked to the rural economy. To qualify for LEADER grant aid you must be a micro enterprise with less than 10 full time employees. FREE consultancy support is available to help project promoters complete the LEADER application form. To hear more, please attend our information evening on Wednesday 2nd May in Drum Community Centre, commencing at 7.00pm (sharp) and will be completed within one hour. You can then make a one to one appointment with our LEADER team to discuss your individual circumstances. To attend, simply call Sheena, RLP on 090 6630252 or e-mail sheena2@ridc.ie to book your place. Please feel free to tell others about this event. Public Information Meeting on Wednesday 2nd May at 9pm sharp in The Abbey Hotel, Roscommon, to deal with all Land Transfers, Capital Taxes and Stamp Duty. Guest Speakers from IFA, Sherry Fitzgerald and Permanent TSB. All welcome to attend. A meeting for parents/guardians will be held in the Central Area of St. Aloysius’ College on Wednesday 2nd May at 7.30pm. Guest speaker: Ms. Helen Doherty, a mother and experienced counsellor who is qualified in working with young people. She is also a qualified Children’s Nurse.